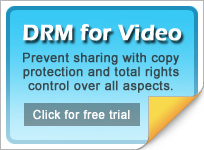 CopySafe Video provides the most secure video protection on the planet, safe from all copy and capture. Optional DRM to prevent sharing. Our Drupal modules for CopySafe PDF and CopySafe Web have been upgraded to cater for Drupal 8. Notable changes were made to the nstall and upload methods. The ArtisBrowser has been upgraeded with new features to better support HTML5 video and CopySafe solutions. Diabolical in protection mode - best web browser in normal mode. Copysafe Web and CopySafe PDF plugins have been checked and verified for Moodle versions up to 3.5. The only significant change required was a bugfix in the PDF plugin for version 3.2. DotNetNuke extensions for CopySafe Web and CopySafe PDF have been upgraded for DNN 9. Includes new inline editor interface and download pages to cater for deficiencies of browsers not supporting NPAPI plugins. The ArtisBrowser remains as the best solution.